Received March 6, 2018; Revised April 3, 2018; Accepted April 4, 2018.; Published online April 18, 2018. ARF is a tumor suppressor protein that has a pivotal role in the prevention of cancer development through regulating cell proliferation, senescence, and apoptosis. 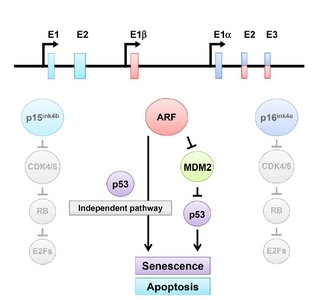 As a factor that induces senescence, the role of ARF as a tumor suppressor is closely linked to the p53-MDM2 axis, which is a key process that restrains tumor formation. Thus, many cancer cells either lack a functional ARF or p53, which enables them to evade cell oncogenic stress-mediated cycle arrest, senescence, or apoptosis. In particular, the ARF gene is a frequent target of genetic and epigenetic alterations including promoter hyper-methylation or gene deletion. However, as many cancer cells still express ARF, pathways that negatively modulate transcriptional or post-translational regulation of ARF could be potentially important means for cancer cells to induce cellular proliferation. These recent findings of regulators affecting ARF protein stability along with its low levels in numerous human cancers indicate the significance of an ARF post-translational mechanism in cancers. Novel findings of regulators stimulating or suppressing ARF function would provide new therapeutic targets to manage cancer- and senescence-related diseases. In this review, we present the current knowledge on the regulation and alterations of ARF expression in human cancers, and indicate the importance of regulators of ARF as a prognostic marker and in potential therapeutic strategies. Uncontrolled cell proliferation is the one of the hallmarks of cancer. Aberrant growth signals or oncogenic stimuli including RAS or c-MYC elicit hyper-proliferation of cells. These processes are normally blocked by a primary fail-safe program including senescence, which is an irreversible cell cycle arrest that restrains aberrant tumor progression (Collado and Serrano, 2010; He and Sharpless, 2017; Lindstrom and Wiman, 2003; Serrano et al., 1997; Zindy et al., 1998). Bypass of the fail-safe program allows cell transformation, with progression of tumorigenesis in normal cells (Brown et al., 1997; Chen et al., 2005; Eischen et al., 1999). The expression of the INK4b/ARF/INK4a gene locus is a well-characterized mechanism used by cells to respond to oncogenic stimuli by instigating cellular senescence (oncogene-induced senescence, OIS) (Evan et al., 1992; Ferbeyre et al., 2002; Lin et al., 1998; Serrano et al., 1997; Vafa et al., 2002; Zhu et al., 1998). The INK4b/ARF/INK4a gene locus located on chromosome 9p21 in humans is one of the most frequently deleted locus in human cancers. This site encodes potent tumor suppressors including p15ink4b, p14ARF, and p16ink4a. p15ink4b has a physically distinct open reading frame and p14ARF and p16ink4a share exons 2 and 3, following the first exon1β and α, respectively (Gil and Peters, 2006). Although they share exon 2 and 3, p14ARF and p16ink4a encode totally different amino acids because of an alternative reading frame. p15ink4b and p16ink4a are the INK4 class of cell cycle inhibitors, which bind to CDK4 and 6, and abolish retinoblastoma (RB) phosphorylation and thus induce G1 phase cell cycle arrest (Collado et al., 2007; Gil and Peters, 2006; Kim and Sharpless, 2006). The function of ARF is quite distinct from other gene products of the INK4b/ARF/INK4a locus (Collado et al., 2007) (Fig. 1). A fundamental role of ARF in tumor suppression is well-characterized and is principally ascribed to its ability to activate p53 in response to oncogenic signals, such as c-MYC (Lindstrom and Wiman, 2003; Zindy et al., 1998). ARF sequesters MDM2, which is a major ubiquitin E3 ligase of p53, into the nucleolus resulting in stabilization of p53, which instigates cellular senescence (Haupt et al., 1997; Kamijo et al., 1998; Lohrum et al., 2000; Weber et al., 2000b; 1999). Besides the p53-dependent roles, ARF also has p53-independent functions to provoke cellular senescence via interaction with numerous proteins including Tip60, NPM, E2F, and HIF1alpha (Brady et al., 2004; Eymin et al., 2001; Fatyol and Szalay, 2001; Ha et al., 2007; Itahana et al., 2003; Kalinichenko et al., 2004; Leduc et al., 2006; Weber et al., 2000a) (Fig. 1). The tumor suppressive function of ARF is supported by the identification of its genetic and epigenetic alterations in diverse human cancers, such as melanoma, pancreatic adenocarcinoma, glioblastoma, certain leukemia, non-small cell lung cancer, and bladder cancer (Berggren et al., 2003; Chaar et al., 2014; Dominguez et al., 2002; 2003; Esteller et al., 2000; Hsu et al., 2004; Iida et al., 2000; Inda et al., 2006; Ito et al., 2004; Kasahara et al., 2006; Konishi et al., 2002; Lee et al., 2006; Nikolic et al., 2015; Sailasree et al., 2008; Shintani et al., 2001; Silva et al., 2001; 2003; Tannapfel et al., 2002a; 2002b; Zochbauer-Muller et al., 2001). Moreover, p19ARF (the mouse form of ARF) knockout mice are highly tumor-prone, with a high incidence of sarcomas and lymphomas (Eischen et al., 1999; Kamijo et al., 1999). Precise regulation of ARF is important for tumor suppression. Accordingly, studies have addressed its regulation, including transcriptional and relatively less identified post-translational regulation, which has deepened our understanding of the regulatory mechanisms of ARF and their importance for inhibition of tumorigenesis. In this review, we present the current knowledge concerning the transcriptional and post-translational regulation of ARF, including newly identified regulators controlling ARF protein stability, and the importance of their status as prognostic markers in cancer. And we also suggest the possibility of a therapeutic strategy to restore ARF activities in cancers. Studies over the past few decades have scrutinized the transcriptional regulation of ARF. Many transcription factors that might regulate ARF expression have been identified, reflecting the functional importance of ARF in tumor suppression. c-MYC is one of the most well-characterized ARF transcription factors (Lindstrom and Wiman, 2003). Upon activation of oncogenic c-MYC, cells execute the OIS fail-safe mechanism to prevent hyper-proliferation through the activation of ARF transcription. c-MYC reportedly binds directly to the E-box element of the ARF promoter region and induces the accumulation of ARF mRNA and proteins in mouse embryonic fibroblasts (MEFs), which can inhibit the immortalization of MEFs (Adhikary and Eilers, 2005; Jacobs et al., 1999b; Zindy et al., 1998). FoxO has also been associated with ARF transcription. c-MYC was demonstrated to induce the accumulation of FoxO in cell nuclei and stimulate the binding of FoxO proteins to the ARF promoter and activate its expression, leading to the suppression of c-MYC-driven lymphomagenesis in mice (Bouchard et al., 2007). Recently, Ko and colleagues reported that c-MYC also regulates the post-translational regulation of ARF as well as its transcription via transcriptional activation of the ARF deubiquitinase USP10 (Ko et al., 2018). This study will address in more detail subsequently. The proteins of E2F family are also well-characterized transcriptional factors of ARF. E2F1 directly binds to E2F1 binding sites in the ARF promoter and activates ARF transcription, leading to apoptosis and growth arrest in REF52 rat embryo fibroblasts (DeGregori et al., 1997). Furthermore, the isoforms of the E2F family of proteins differently regulate ARF transcription. For example, E2F3b (an isoform of E2F3) interacts with the ARF promoter region and represses its expressions, while E2F3a and E2F1 enhance ARF transcription in MEFs (Aslanian et al., 2004). DMP1, a cyclin D-binding Myb-like protein, binds to a single canonical recognition site in the ARF promoter and activates its expression, which promotes p53-dependent cell cycle arrest in MEFs and NIH 3T3 cells (Inoue et al., 1999). Oncogenic RAS signaling promotes DMP1 (Dentin matrix acidic phosphoprotein 1)-mediated ARF transcription in a c-Jun- or JunB-dependent manner (Sreeramaneni et al., 2005). Recently, it was reported that isoforms of human DMP1 differently regulate ARF transcription. DMP1α stimulates ARF transcription and DMP1β antagonizes its action on ARF expression by sequestering DMP1α from the ARF promoter region (Tschan et al., 2015). In addition to these observations, it was reported that transforming growth factor-beta (TGFβ) signaling activates ARF transcription via a direct interaction of Smad2/3 with the ARF promoter and activation of the p38 mitogen-activated protein kinase (p38 MAPK) pathway (Zheng et al., 2010). TGFβ induces the binding of Smad2/3, histone H3 acetylation, and recruitment of RNA polymerase II to the ARF locus, inducing ARF transcription in MEFs (Zheng et al., 2010). Although the mode of action of the p38 MAPK signaling pathway in transcriptional activation of ARF remains unclear, ARF transcription induced by TGFβ and RAS signaling is attenuated by the treatment of MEFs with the p38 MAPK inhibitor SB203580 (Zheng et al., 2010). Another previous report described that Wip1 (Wild-type p53-induced phosphatase 1) phosphatase suppresses ARF expression by inhibiting p38 MAPK signaling (Bulavin et al., 2004). HKR3 (Human Krüppel-related 3) is also a positive regulator of ARF expression. HKR3 binds to the ARF promoter with coactivator p300 and activates its transcription (Yoon et al., 2014). Furthermore, acute myeloid leukemia-1 (AML1) activates its transcription through an association with the ARF promoter, thus eliciting cellular senescence in MEFs and human cells. However, the t(8;21) translocation induced fusion protein AML-ETO, which is present in ~12–15% of AML patients, acts as a repressor of ARF transcription (Linggi et al., 2002). Negative regulators of ARF transcription are as varied as its positive regulators. The polycomb group gene BMI-1 (B cell-specific moloney murine leukemia virus integration site 1) was identified as a transcriptional repressor of ARF (Jacobs et al., 1999a). BMI-1 deficient MEFs manifest premature senescence and impaired proliferation. Both are rescued by the simultaneous deletion of ARF (Jacobs et al., 1999a). Another study demonstrated that BMI-1-containing polycomb-repressive complex 1 (PRC1)-mediated ARF transcription repression requires the EZH2 (the histone methyltransferase enhancer of zeste homolog 2)-containing PRC2 complex to maintain the tri-methylation levels of histone H3 on Lys 27 (H3K27me3) in the ARF locus (Bracken et al., 2007). Another polycomb group gene, CBX7, also prolongs cell proliferation with reduced ARF expression in human cells and MEFs (Gil et al., 2004). In addition, Twist-1, the basic helix-loop-helix (bHLH) transcription factor, recruits EZH2 to the promoter region of ARF, which represses its transcription via the increased H3K27me3 on the ARF locus, and suppresses cellular senescence in human bone marrow (BM)-derived mesenchymal stem stromal cells (Cakouros et al., 2012). The T-box member TBX2 also negatively controls the transcription of ARF, which stimulates immortalization of MEFs (Jacobs et al., 2000). Recently, D Dayde and colleagues described that mutant EGFR-L858R inhibits ARF transcription. Vsp34 enhances EGRF-L858R nuclear trafficking and its accumulation to the ARF promoter attenuates ARF transcription in response to EGF stimulation in lung tumor cells (Dayde et al., 2016) (Table 1). Although many studies of transcriptional regulation of ARF have been done since the 1990s, studies on its post-translational regulation have been conducted only relatively recently. Further research focused on identifying post-translational events that regulate ARF protein stability has defined several regulators of ARF and their importance in tumor suppression. Although it has been widely assumed that ARF expression is mainly regulated at the transcriptional level, research that focused on the post-translational regulation of ARF revealed that ARF proteins can be ubiquitinated and degraded via proteasomal degradation (Kuo et al., 2004; Sherr, 2006). In 2004, Kuo and colleagues have identified that human ARF, a lysine less protein, and mouse p19ARF, which has a single lysine, can be polyubiquitinated at their N-terminal amino group, followed by proteasomal degradation without any clue to the enzymes mediating this process (Kuo et al., 2004). The first ubiquitin E3-ligase was identified in 2010. The authors observed that TRIP12 induces ARF ubiquitination and proteasomal degradation, which leads to the activation of cellular proliferation. The enzyme was designated ULF (Ubiquitin ligase for ARF). ULF-mediated ARF degradation is negatively regulated by nucleophosmin (NPM) and c-Myc through direct interaction, underscoring the importance of transcription-independent regulation of ARF under oncogenic stress (Chen et al., 2010). Another study described that USP7 accelerates ARF degradation through deubiquitination and stabilization of TRIP12, and promotes the progression of hepatocellular carcinoma (Cai et al., 2015). These findings emphasize the impact of ARF ubiquitination and degradation in cancer development. Subsequently, the second ubiquitin E3-ligase of ARF Makorin 1 (MKRN1) was identified (Ko et al., 2012). Ablation or knock-out of MKRN1 can induce cell growth retardation and cellular senescence through the ubiquitination-dependent degradation of ARF in gastric cancer cell lines, human normal cells, and mouse embryonic fibroblasts (MEFs). MKRN1 ablation can reduce tumor growth of p53 positive and p53 negative gastric cancer cells through the induction of ARF-mediated cellular senescence in a xenograft model. Furthermore, MKRN1 was reported to be highly expressed in well-differentiated gastric carcinoma and was negatively correlation with ARF expression. These results indicate the significance of the post-translational regulation of ARF protein in tumorigenesis. Siva1 was also identified as a ubiquitin E3-ligase of ARF, which inhibits p53 function through ARF polyubiquitination and degradation (Wang et al., 2013). Interestingly, distinct from these mechanisms of ARF degradation mediated by E3 ligases, chaperon HSP90 and ubiquitin E3-ligase, CHIP (Carboxyl terminus of Hsc70-interacting protein) cooperatively induce ubiquitination independent lysosomal degradation of ARF. HSP90 and CHIP form a ternary complex with ARF and accelerate the ubiquitination-independent lysosomal degradation (Han et al., 2017). Ablation or knock-out of CHIP, and ablation or inhibition of HSP90 by its inhibitor, geldanamycin (GA), can induce cell growth retardation and cellular senescence in human normal cells and MEFs. Non-small cell lung cancer (NSCLC) patients with a high expression of HSP90 and CHIP, and low expression of ARF have a significantly worse overall survival rate, and these expression patterns have been implicated as independent prognostic factors. Interestingly, the presence of ARF was reported to significantly increase the sensitivity of NSCLC cancer cells to GA treatment, regardless of endothelial growth factor receptor (EGFR) mutation, ALK (Anaplastic lymphoma kinase) fusion and p53 status, which are frequently identified genetic alterations in NSCLC, suggesting that ARF could be an important criterion for an effective therapeutic strategy using HSP90 inhibitors. HSP90 is recognized as a potent oncogenic protein that stabilizes various growth factor receptors including EGFR and signaling molecules, such as phospho-inoside-3-kinase (PI3K) and AKT, and numerous oncoproteins including mutant p53 (Kamal et al., 2004). In addition to these functions, these findings suggest a new concept, in which HSP90 can induce the degradation of the ARF tumor suppressor, independent of ubiquitination via chaperone-mediated autophagy (CMA). This event, along with onco-protein stabilization, stimulates tumorigenesis. In addition to these regulatory factors that mediate ARF degradation, a recent paper identified the first deubiquitinase of ARF that induces deubiquitination and stabilization of ARF. Ko and colleagues found that oncogenic c-MYC increases ARF protein stability in addition to its transcription through induction of the deubiquitinase USP10 (Ko et al., 2018). Upon induction by c-Myc, USP10 in turn stimulates deubiquitination followed by stabilization of ARF, which promotes cellular senescence (Ko et al., 2018). Corroborating these findings, the ablation or knockdown of USP10 in human normal cells and MEFs, respectively, induces the bypass of the c-MYC-mediated OIS (Ko et al., 2018). Clinically, the positive correlation of c-MYC expression with USP10 and ARF expression can be disrupted in several cancer cell lines and NSCLC tissues (Ko et al., 2018). These results implicate USP10 could be an important factor that is essential for c-MYC-mediated OIS through the post-translational regulation of ARF (Ko et al., 2018) (Fig. 2). Further studies revealing the intricate interactions among these regulatory proteins with ARF upon diverse oncogenic stimulation and identifying the correlated signaling pathways disrupted in human cancers will provide more information concerning possible therapeutic targets that could prevent tumorigenesis. The identification of numerous genetic and epigenetic alterations of the ARF locus has provided convincing support for the notion that ARF functions as a tumor suppressor. The low expression of ARF mRNA is frequently observed in human cancers and is caused by promoter hyper-methylation and deletion of the genetic region. The ARF promoter contains a CpG island that can be silenced by hyper-methylation. Inactivation of ARF by this epigenetic alteration has been amply described in numerous human cancers including breast, bladder, colon, liver, gastric, lung, oral, prostate and brain cancers (Chaar et al., 2014; Dominguez et al., 2002; 2003; Esteller et al., 2000; Hsu et al., 2004; Iida et al., 2000; Konishi et al., 2002; Lee et al., 2006; Sailasree et al., 2008; Shintani et al., 2001; Silva et al., 2003; Tannapfel et al., 2002a; Tannapfel et al., 2002b; Zochbauer-Muller et al., 2001). This alteration that induces ARF inactivation has emerged as a predictor of the poor prognosis of many cancer patients. INK4a and ARF hyper-methylation are associated with frequent lymph node metastasis and higher tumor grade in colon cancer, and significantly correlate with worse prognosis in breast, head and neck, colon and bladder carcinomas (Dominguez et al., 2003; Kawamoto et al., 2006; Kim et al., 2000; Lee et al., 2006). The chromosome 9p21 segment, where the INK4a/ARF gene is located, is one of the major deletion sites (Cairns et al., 1994; Dominguez et al., 2003). Homozygous deletion at the INK4a/ARF locus and loss of heterozygosity affecting ARF low expression have been detected in many cancers (Berggren et al., 2003; Hsu et al., 2004; Ito et al., 2004; Kasahara et al., 2006; Konishi et al., 2002; Sailasree et al., 2008; Shintani et al., 2001; Silva et al., 2003; Tannapfel et al., 2002b). These alterations of promoter hyper-methylation and genetic deletion found in cancers often correlation with the low expression of ARF in cancers. Conversely, the overexpression of ARF mRNA without any genetic or epigenetic alteration in its locus has been described in several cancers (Ito et al., 2004; Silva et al., 2003). As ARF responds to various oncogenic stimuli including c-MYC, RAS, and E2F1 to accelerate the fail-safe program, such as apoptosis and senescence, against a hyper-proliferation, these mechanisms probably could occur in these cancers. An ARF germline mutation is frequently detected in familial melanoma. These mutations include short deletion or short insertion in exon 1 beta and missense mutation in exon 2, and functionally impair ARF (Hewitt et al., 2002; Randerson-Moor et al., 2001; Rizos et al., 2001a; 2001b). ARF mutations are detected in other cancer types, albeit rarely (Berggren et al., 2003; Ito et al., 2004). The alteration status of post-translational mechanisms affecting ARF protein expression in cancer has not been firmly addressed compared to its genetic or epigenetic alterations. As the importance of post-translational regulation of ARF emerges, the status of protein expression of ARF and its regulators in cancers should be pursued. Indeed, several studies showed the possibility of ARF disruption at the post-translational level in cancers in the late 1990s. The loss of ARF protein expression was identified in several hematopoietic tumor cell lines, which have abundant beta transcripts (Della Valle et al., 1997). Another study reported the complete absence of ARF protein expression in small cell lung cancer cells, but not in normal cells surrounding tumor cells, with frequent uncoupling between transcripts and the ARF (Gazzeri et al., 1998). These reports imply the possibility of the disruption of translational or post-translational regulation of ARF in cancers. The relationships between ARF protein expression and clinical outcome and prognosis in cancers have been addressed. The loss of ARF protein expression correlates with poor outcome of squamous cell carcinoma of the anterior tongue (Kwong et al., 2005). Absent expression of ARF protein is associated with ovarian carcinomas compared to borderline and benign tumors, which suggests that ARF abnormalities occur later in carcinogenesis (Cabral et al., 2016). ARF expression has been negatively correlated with the expression of its E3 ubiquitin ligase, MKRN1, in gastric cancer. MKRN1 overexpression with low expression of ARF has been significantly associated with well-differentiated gastric carcinoma (Ko et al., 2012). The inverse association between protein expression levels of ARF and CHIP, which induce lysosomal degradation of ARF with the aid of HSP90, has been detected in NSCLC. Furthermore, the high expressions of HSP90 and CHIP, and low expression of ARF have been associated with a significantly worse overall survival rate and was an independent prognostic marker in NSCLC (Han et al., 2017). In contrast with normal cells, c-MYC expression has been reversely correlated with USP10 and ARF in NSCLC. Patients with high expression of c-MYC and low expression of USP10 and ARF have significantly worse overall survival. This status is an independent prognostic factor with respect to overall survival in NSCLC (Ko et al., 2018). These results suggest that the post-translational regulation of ARF is disrupted in human cancers and might be an important mechanism that affects tumor progression and clinical outcomes of cancers. On the contrary, several studies described that overexpression of ARF proteins heralds a worse clinical outcome in cancers. Breast cancer patients with increased expression of ARF displayed a high risk of disease recurrence, with no influence on the survival rate (Davy et al., 2009). ARF is a nucleolar protein that sequesters MDM2 into the nucleolus and activates p53. Interestingly, in these tumors ARF was expressed in the cytoplasm rather than the nucleolus. Cytoplasmic expression of ARF has been detected in several human cancers including NSCLC, pancreatic, gastric and prostate cancer (Cabral et al., 2016; Jarrard et al., 1998; Klump et al., 2003; Ko et al., 2012; Vonlanthen et al., 1998). These results might be possibly related to the functional impairment of cytosolic ARF (Rizos et al., 2000; Weber et al., 2000b). Further studies identifying the complex mechanisms regulating ARF expression, stability, localization and function, and the impact of their disruption on cancer development with multidisciplinary approach are needed for a better understanding of the pathological function of ARF, which could utilize our scientific knowledge for clinical application. Tumor suppressive functions of ARF have been demonstrated. ARF is deregulated through gene silencing by promoter hyper-methylation, genetic locus deletion and mutation in numerous human cancers. Research on ARF regulation focused on its transcription have identified numerous positive and negative transcriptional factors of ARF. In addition to transcriptional regulation, post-translational control mechanisms of ARF, which are directly linked to their suppression of tumorigenesis, are being elucidated. Recent research has identified several E3 ubiquitin ligases and deubiquitinase, which control ARF protein stability. The findings suggest the importance of the post-translational regulation of ARF in tumor suppression. They can regulate cellular senescence and tumor growth by controlling the stability of ARF protein in cells and mice xenograft models. Supporting these results, the negative correlation between E3-ubiquitin ligases and ARF protein levels or decreased expression of deubiquitinase and ARF has been detected in several human cancers, and these expression patterns are associated with a significantly low survival rate. Although the post-translational regulators of ARF and their roles in tumorigenesis have been defined, more regulators need to be discovered and how they can be fine-tuned to regulate ARF protein stability upon oncogenic stimuli remains unclear. The presence of various factors affecting ARF stability could be context-dependent and their association with a variety of cancer should be further pursued. As ARF is one of the well-established tumor suppressors and low levels of ARF protein and mRNA have emerged as an important potential prognostic marker in several human cancers, restoring ARF activity would be a promising therapeutic strategy for cancers. Indeed, given that treatment of GA has a significant cytotoxic effect on ARF-positive NSCLC cell lines compared to ARF-negative cells due to the increased protein stability of ARF, various HSP90 inhibitors including GA analogs developed as cancer drug for clinical trials could be a good therapeutic strategy for NSCLC with high expression of HSP90 and low expression of ARF. Future studies focusing on identifying the complex networks that regulate ARF proteins and their disruption in human cancers will hopefully provide promising therapeutic targets for cancers harboring low expression of ARF proteins. Fig. 1. The INK4a/ARF/INK4b locus encodes potent tumor suppressors including p15ink4b, p16ink4a and p14ARF. ARF stimulates cellular senescence and apoptosis through p53-dependent or -independent pathway, thus suppressing the tumor formation. Fig. 2. E3 ubiquitin ligases, SIVA1, MKRN1 and ULF induces ubiquitination dependent pro-teasomal degradation of ARF, which is reversed by deubiquitinase, USP10-mediated deubiquitination. 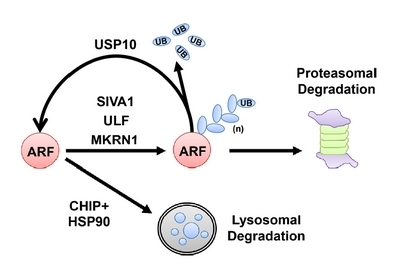 CHIP and HSP90 cooperatively stimulates ubiquitin-independent lysosomal degradation of ARF. Adhikary, S., and Eilers, M. (2005). Transcriptional regulation and transformation by Myc proteins. Nat Rev Mol Cell Biol. 6, 635-645. Aslanian, A., Iaquinta, P.J., Verona, R., and Lees, J.A. (2004). Repression of the Arf tumor suppressor by E2F3 is required for normal cell cycle kinetics. Genes Dev. 18, 1413-1422. Berggren, P., Kumar, R., Sakano, S., Hemminki, L., Wada, T., Steineck, G., Adolfsson, J., Larsson, P., Norming, U., and Wijkstrom, H. (2003). Detecting homozygous deletions in the CDKN2A(p16(INK4a))/ARF(p14(ARF)) gene in urinary bladder cancer using real-time quantitative PCR. Clin Cancer Res. 9, 235-242. Bouchard, C., Lee, S., Paulus-Hock, V., Loddenkemper, C., Eilers, M., and Schmitt, C.A. (2007). FoxO transcription factors suppress Myc-driven lymphomagenesis via direct activation of Arf. Genes Dev. 21, 2775-2787. Bracken, A.P., Kleine-Kohlbrecher, D., Dietrich, N., Pasini, D., Gargiulo, G., Beekman, C., Theilgaard-Monch, K., Minucci, S., Porse, B.T., and Marine, J.C. (2007). The Polycomb group proteins bind throughout the INK4A-ARF locus and are disassociated in senescent cells. Genes Dev. 21, 525-530. Brady, S.N., Yu, Y., Maggi, L.B., and Weber, J.D. (2004). ARF impedes NPM/B23 shuttling in an Mdm2-sensitive tumor suppressor pathway. Mol Cell Biol. 24, 9327-9338. Brown, J.P., Wei, W., and Sedivy, J.M. (1997). Bypass of senescence after disruption of p21CIP1/WAF1 gene in normal diploid human fibroblasts. Science. 277, 831-834. Bulavin, D.V., Phillips, C., Nannenga, B., Timofeev, O., Donehower, L.A., Anderson, C.W., Appella, E., and Fornace, A.J. (2004). Inactivation of the Wip1 phosphatase inhibits mammary tumorigenesis through p38 MAPK-mediated activation of the p16(Ink4a)-p19(Arf) pathway. Nat Genet. 36, 343-350. Cabral, V.D., Cerski, M.R., Sa Brito, I.T., and Kliemann, L.M. (2016). p14 expression differences in ovarian benign, borderline and malignant epithelial tumors. J Ovarian Res. 9, 69. Cai, J.B., Shi, G.M., Dong, Z.R., Ke, A.W., Ma, H.H., Gao, Q., Shen, Z.Z., Huang, X.Y., Chen, H., and Yu, D.D. (2015). Ubiquitin-specific protease 7 accelerates p14(ARF) degradation by deubiquitinating thyroid hormone receptor-interacting protein 12 and promotes hepatocellular carcinoma progression. Hepatology. 61, 1603-1614. Cairns, P., Tokino, K., Eby, Y., and Sidransky, D. (1994). Homozygous deletions of 9p21 in primary human bladder tumors detected by comparative multiplex polymerase chain reaction. Cancer Res. 54, 1422-1424. Cakouros, D., Isenmann, S., Cooper, L., Zannettino, A., Anderson, P., Glackin, C., and Gronthos, S. (2012). Twist-1 induces Ezh2 recruitment regulating histone methylation along the Ink4A/Arf locus in mesenchymal stem cells. Mol Cell Biol. 32, 1433-1441. Chaar, I., Amara, S., Elamine, O.E., Khiari, M., Ounissi, D., Khalfallah, T., Ben Hmida, A., Mzabi, S., and Bouraoui, S. (2014). Biological significance of promoter hypermethylation of p14/ARF gene: relationships to p53 mutational status in Tunisian population with colorectal carcinoma. Tumour Biol. 35, 1439-1449. Chen, Z., Trotman, L.C., Shaffer, D., Lin, H.K., Dotan, Z.A., Niki, M., Koutcher, J.A., Scher, H.I., Ludwig, T., and Gerald, W. (2005). Crucial role of p53-dependent cellular senescence in suppression of Pten-deficient tumorigenesis. Nature. 436, 725-730. Chen, D., Shan, J., Zhu, W.G., Qin, J., and Gu, W. (2010). Transcription-independent ARF regulation in oncogenic stress-mediated p53 responses. Nature. 464, 624-627. Collado, M., and Serrano, M. (2010). Senescence in tumours: evidence from mice and humans. Nat Rev Cancer. 10, 51-57. Collado, M., Blasco, M.A., and Serrano, M. (2007). Cellular senescence in cancer and aging. Cell. 130, 223-233. Davy, P., Nagata, M., Bullard, P., Fogelson, N.S., and Allsopp, R. (2009). Fetal growth restriction is associated with accelerated telomere shortening and increased expression of cell senescence markers in the placenta. Placenta. 30, 539-542. Dayde, D., Guerard, M., Perron, P., Hatat, A.S., Barrial, C., Eymin, B., and Gazzeri, S. (2016). Nuclear trafficking of EGFR by Vps34 represses Arf expression to promote lung tumor cell survival. Oncogene. 35, 3986-3994. DeGregori, J., Leone, G., Miron, A., Jakoi, L., and Nevins, J.R. (1997). Distinct roles for E2F proteins in cell growth control and apoptosis. Proc Natl Acad Sci USA. 94, 7245-7250. Della Valle, V., Duro, D., Bernard, O., and Larsen, C.J. (1997). The human protein p19ARF is not detected in hemopoietic human cell lines that abundantly express the alternative beta transcript of the p16INK4a/MTS1 gene. Oncogene. 15, 2475-2481. Dominguez, G., Carballido, J., Silva, J., Silva, J.M., Garcia, J.M., Menendez, J., Provencio, M., Espana, P., and Bonilla, F. (2002). p14ARF promoter hypermethylation in plasma DNA as an indicator of disease recurrence in bladder cancer patients. Clin Cancer Res. 8, 980-985. Dominguez, G., Silva, J., Garcia, J.M., Silva, J.M., Rodriguez, R., Munoz, C., Chacon, I., Sanchez, R., Carballido, J., and Colas, A. (2003). Prevalence of aberrant methylation of p14ARF over p16INK4a in some human primary tumors. Mutation Res. 530, 9-17. Eischen, C.M., Weber, J.D., Roussel, M.F., Sherr, C.J., and Cleveland, J.L. (1999). Disruption of the ARF-Mdm2-p53 tumor suppressor pathway in Myc-induced lymphomagenesis. Genes Dev. 13, 2658-2669. Esteller, M., Tortola, S., Toyota, M., Capella, G., Peinado, M.A., Baylin, S.B., and Herman, J.G. (2000). Hypermethylation-associated inactivation of p14(ARF) is independent of p16(INK4a) methylation and p53 mutational status. Cancer Res. 60, 129-133. Evan, G.I., Wyllie, A.H., Gilbert, C.S., Littlewood, T.D., Land, H., Brooks, M., Waters, C.M., Penn, L.Z., and Hancock, D.C. (1992). Induction of apoptosis in fibroblasts by C-Myc protein. Cell. 69, 119-128. Eymin, B., Karayan, L., Seite, P., Brambilla, C., Brambilla, E., Larsen, C.J., and Gazzeri, S. (2001). Human ARF binds E2F1 and inhibits its transcriptional activity. Oncogene. 20, 1033-1041. Fatyol, K., and Szalay, A.A. (2001). The p14ARF tumor suppressor protein facilitates nucleolar sequestration of hypoxia-inducible factor-1alpha (HIF-1alpha ) and inhibits HIF-1-mediated transcription. J Biol Chem. 276, 28421-28429. Ferbeyre, G., de Stanchina, E., Lin, A.W., Querido, E., McCurrach, M.E., Hannon, G.J., and Lowe, S.W. (2002). Oncogenic ras and p53 cooperate to induce cellular senescence. Mol Cell Biol. 22, 3497-3508. Gazzeri, S., Della Valle, V., Chaussade, L., Brambilla, C., Larsen, C.J., and Brambilla, E. (1998). The human p19ARF protein encoded by the beta transcript of the p16INK4a gene is frequently lost in small cell lung cancer. Cancer Res. 58, 3926-3931. Gil, J., and Peters, G. (2006). Regulation of the INK4b-ARF-INK4a tumour suppressor locus: all for one or one for all. Nat Rev Mol Cell Biol. 7, 667-677. Gil, J., Bernard, D., Martinez, D., and Beach, D. (2004). Polycomb CBX7 has a unifying role in cellular lifespan. Nat Cell Biol. 6, 67-72. Ha, L., Ichikawa, T., Anver, M., Dickins, R., Lowe, S., Sharpless, N.E., Krimpenfort, P., Depinho, R.A., Bennett, D.C., and Sviderskaya, E.V. (2007). ARF functions as a melanoma tumor suppressor by inducing p53-independent senescence. Proc Natl Acad Sci USA. 104, 10968-10973. Han, S.Y., Ko, A., Kitano, H., Choi, C.H., Lee, M.S., Seo, J., Fukuoka, J., Kim, S.Y., Hewitt, S.M., and Chung, J.Y. (2017). Molecular chaperone HSP90 is necessary to prevent cellular senescence via lysosomal degradation of p14ARF. Cancer Res. 77, 343-354. Haupt, Y., Maya, R., Kazaz, A., and Oren, M. (1997). Mdm2 promotes the rapid degradation of p53. Nature. 387, 296-299. He, S., and Sharpless, N.E. (2017). Senescence in health and disease. Cell. 169, 1000-1011. Hewitt, C., Lee Wu, C., Evans, G., Howell, A., Elles, R.G., Jordan, R., Sloan, P., Read, A.P., and Thakker, N. (2002). Germline mutation of ARF in a melanoma kindred. Hum Mol Genet. 11, 1273-1279. Hsu, H.S., Wang, Y.C., Tseng, R.C., Chang, J.W., Chen, J.T., Shih, C.M., Chen, C.Y., and Wang, Y.C. (2004). 5′ cytosine-phospho-guanine island methylation is responsible for p14ARF inactivation and inversely correlates with p53 overexpression in resected non-small cell lung cancer. Clin Cancer Res. 10, 4734-4741. Iida, S., Akiyama, Y., Nakajima, T., Ichikawa, W., Nihei, Z., Sugihara, K., and Yuasa, Y. (2000). Alterations and hypermethylation of the p14(ARF) gene in gastric cancer. Int J Cancer. 87, 654-658. Inda, M.M., Munoz, J., Coullin, P., Fauvet, D., Danglot, G., Tunon, T., Bernheim, A., and Castresana, J.S. (2006). High promoter hypermethylation frequency of p14/ARF in supratentorial PNET but not in medulloblastoma. Histopathology. 48, 579-587. Inoue, K., Roussel, M.F., and Sherr, C.J. (1999). Induction of ARF tumor suppressor gene expression and cell cycle arrest by transcription factor DMP1. Proc Natl Acad Sci USA. 96, 3993-3998. Itahana, K., Bhat, K.P., Jin, A., Itahana, Y., Hawke, D., Kobayashi, R., and Zhang, Y. (2003). Tumor suppressor ARF degrades B23, a nucleolar protein involved in ribosome biogenesis and cell proliferation. Mol Cell. 12, 1151-1164. Ito, T., Nishida, N., Fukuda, Y., Nishimura, T., Komeda, T., and Nakao, K. (2004). Alteration of the p14(ARF) gene and p53 status in human hepatocellular carcinomas. J Gastroenterol. 39, 355-361. Jacobs, J.J., Kieboom, K., Marino, S., DePinho, R.A., and van Lohuizen, M. (1999a). The oncogene and Polycomb-group gene bmi-1 regulates cell proliferation and senescence through the ink4a locus. Nature. 397, 164-168. Jacobs, J.J., Scheijen, B., Voncken, J.W., Kieboom, K., Berns, A., and van Lohuizen, M. (1999b). Bmi-1 collaborates with c-Myc in tumorigenesis by inhibiting c-Myc-induced apoptosis via INK4a/ARF. Genes Dev. 13, 2678-2690. Jacobs, J.J., Keblusek, P., Robanus-Maandag, E., Kristel, P., Lingbeek, M., Nederlof, P.M., van Welsem, T., van de Vijver, M.J., Koh, E.Y., and Daley, G.Q. (2000). Senescence bypass screen identifies TBX2, which represses Cdkn2a (p19(ARF)) and is amplified in a subset of human breast cancers. Nat Genet. 26, 291-299. Jarrard, D.F., Yeager, T.R., Nassif, N., Sandefur, C.E., and Reznikoff, C.A. (1998). Loss of either p16/CDKN2 or retinoblastoma is required for overcoming senescence in human prostate epithelial cells. J Urol. 159, 71-71. Kalinichenko, V.V., Major, M.L., Wang, X., Petrovic, V., Kuechle, J., Yoder, H.M., Dennewitz, M.B., Shin, B., Datta, A., and Raychaudhuri, P. (2004). Foxm1b transcription factor is essential for development of hepatocellular carcinomas and is negatively regulated by the p19ARF tumor suppressor. Genes Dev. 18, 830-850. Kamal, A., Boehm, M.F., and Burrows, F.J. (2004). Therapeutic and diagnostic implications of Hsp90 activation. Trends Mol Med. 10, 283-290. Kamijo, T., Weber, J.D., Zambetti, G., Zindy, F., Roussel, M.F., and Sherr, C.J. (1998). Functional and physical interactions of the ARF tumor suppressor with p53 and Mdm2. Proc Natl Acad Sci USA. 95, 8292-8297. Kamijo, T., Bodner, S., van de Kamp, E., Randle, D.H., and Sherr, C.J. (1999). Tumor spectrum in ARF-deficient mice. Cancer Res. 59, 2217-2222. Kasahara, T., Bilim, V., Hara, N., Takahashi, K., and Tomita, Y. (2006). Homozygous deletions of the INK4a/ARF locus in renal cell cancer. Anticancer Res. 26, 4299-4305. Kawamoto, K., Enokida, H., Gotanda, T., Kubo, H., Nishiyama, K., Kawahara, M., and Nakagawa, M. (2006). p16INK4a and p14ARF methylation as a potential biomarker for human bladder cancer. Biochem Biophys Res Commun. 339, 790-796. Kim, W.Y., and Sharpless, N.E. (2006). The regulation of INK4/ARF in cancer and aging. Cell. 127, 265-275. Kim, H.S., Chung, W.B., Hong, S.H., Kim, J.A., Na, S.Y., Jang, H.J., Sohn, Y.K., and Kim, J.W. (2000). Inactivation of p16INK4a in primary tumors and cell lines of head and neck squamous cell carcinoma. Mol Cells. 10, 557-565. Klump, B., Hsieh, C.J., Nehls, O., Dette, S., Holzmann, K., Kiesslich, R., Jung, M., Sinn, U., Ortner, M., and Porschen, R. (2003). Methylation status of p14ARF and p16INK4a as detected in pancreatic secretions. Br J Cancer. 88, 217-222. Ko, A., Shin, J.Y., Seo, J., Lee, K.D., Lee, E.W., Lee, M.S., Lee, H.W., Choi, I.J., Jeong, J.S., and Chun, K.H. (2012). Acceleration of gastric tumorigenesis through MKRN1-mediated posttranslational regulation of p14ARF. J Natl Cancer Inst. 104, 1660-1672. Ko, A., Han, S.Y., Choi, C.H., Cho, H., Lee, M.S., Kim, S.Y., Song, J.S., Hong, K.M., Lee, H.W., and Hewitt, S.M. (2018). Oncogene-induced senescence mediated by c-Myc requires USP10 dependent deubiquitination and stabilization of p14ARF. Cell Death Differ. Konishi, N., Nakamura, M., Kishi, M., Nishimine, M., Ishida, E., and Shimada, K. (2002). Heterogeneous methylation and deletion patterns of the INK4a/ARF locus within prostate carcinomas. Am J Pathol. 160, 1207-1214. Kuo, M.L., den Besten, W., Bertwistle, D., Roussel, M.F., and Sherr, C.J. (2004). N-terminal polyubiquitination and degradation of the Arf tumor suppressor. Genes Dev. 18, 1862-1874. Kwong, R.A., Kalish, L.H., Nguyen, T.V., Kench, J.G., Bova, R.J., Cole, I.E., Musgrove, E.A., and Sutherland, R.L. (2005). p14ARF protein expression is a predictor of both relapse and survival in squamous cell carcinoma of the anterior tongue. Clin Cancer Res. 11, 4107-4116. Leduc, C., Claverie, P., Eymin, B., Col, E., Khochbin, S., Brambilla, E., and Gazzeri, S. (2006). p14ARF promotes RB accumulation through inhibition of its Tip60-dependent acetylation. Oncogene. 25, 4147-4154. Lee, M., Sup Han, W., Kyoung Kim, O., Hee Sung, S., Sun Cho, M., Lee, S.N., and Koo, H. (2006). Prognostic value of p16INK4a and p14ARF gene hypermethylation in human colon cancer. Pathol Res Pract. 202, 415-424. Lin, A.W., Barradas, M., Stone, J.C., van Aelst, L., Serrano, M., and Lowe, S.W. (1998). Premature senescence involving p53 and p16 is activated in response to constitutive MEK/MAPK mitogenic signaling. Genes Dev. 12, 3008-3019. Lindstrom, M.S., and Wiman, K.G. (2003). Myc and E2F1 induce p53 through p14ARF-independent mechanisms in human fibroblasts. Oncogene. 22, 4993-5005. Linggi, B., Muller-Tidow, C., van de Locht, L., Hu, M., Nip, J., Serve, H., Berdel, W.E., van der Reijden, B., Quelle, D.E., and Rowley, J.D. (2002). The t(8;21) fusion protein, AML1 ETO, specifically represses the transcription of the p14(ARF) tumor suppressor in acute myeloid leukemia. Nat Med. 8, 743-750. Lohrum, M.A.E., Ashcroft, M., Kubbutat, M.H.G., and Vousden, K.H. (2000). Contribution of two independent MDM2-binding domains in p14(ARF) to p53 stabilization. Curr Biol. 10, 539-542. Nikolic, N., Anicic, B., Carkic, J., Simonovic, J., Toljic, B., Tanic, N., Tepavcevic, Z., Vukadinovic, M., Konstantinovic, V.S., and Milasin, J. (2015). High frequency of p16 and p14 promoter hypermethylation and marked telomere instability in salivary gland tumors. Arch Oral Biol. 60, 1662-1666. Randerson-Moor, J.A., Harland, M., Williams, S., Cuthbert-Heavens, D., Sheridan, E., Aveyard, J., Sibley, K., Whitaker, L., Knowles, M., and Bishop, J.N. (2001). A germline deletion of p14(ARF) but not CDKN2A in a melanoma-neural system tumour syndrome family. Hum Mol Genet. 10, 55-62. Rizos, H., Darmanian, A.P., Mann, G.J., and Kefford, R.F. (2000). Two arginine rich domains in the p14ARF tumour suppressor mediate nucleolar localization. Oncogene. 19, 2978-2985. Rizos, H., Darmanian, A.P., Holland, E.A., Mann, G.J., and Kefford, R.F. (2001a). Mutations in the INK4a/ARF melanoma susceptibility locus functionally impair p14ARF. J Biol Chem. 276, 41424-41434. Rizos, H., Puig, S., Badenas, C., Malvehy, J., Darmanian, A.P., Jimenez, L., Mila, M., and Kefford, R.F. (2001b). A melanoma-associated germline mutation in exon 1beta inactivates p14ARF. Oncogene. 20, 5543-5547. Sailasree, R., Abhilash, A., Sathyan, K.M., Nalinakumari, K.R., Thomas, S., and Kannan, S. (2008). Differential roles of p16INK4A and p14ARF genes in prognosis of oral carcinoma. Cancer Epidemiol Biomarkers Prev. 17, 414-420. Serrano, M., Lin, A.W., McCurrach, M.E., Beach, D., and Lowe, S.W. (1997). Oncogenic ras provokes premature cell senescence associated with accumulation of p53 and p16INK4a. Cell. 88, 593-602. Sherr, C.J. (2006). Divorcing ARF and p53: an unsettled case. Nat Rev Cancer. 6, 663-673. Shintani, S., Nakahara, Y., Mihara, M., Ueyama, Y., and Matsumura, T. (2001). Inactivation of the p14(ARF), p15(INK4B) and p16(INK4A) genes is a frequent event in human oral squamous cell carcinomas. Oral Oncol. 37, 498-504. Silva, J., Dominguez, G., Silva, J.M., Garcia, J.M., Gallego, I., Corbacho, C., Provencio, M., Espana, P., and Bonilla, F. (2001). Analysis of genetic and epigenetic processes that influence p14ARF expression in breast cancer. Oncogene. 20, 4586-4590. Silva, J., Silva, J.M., Dominguez, G., Garcia, J.M., Cantos, B., Rodriguez, R., Larrondo, F.J., Provencio, M., Espana, P., and Bonilla, F. (2003). Concomitant expression of p16INK4a and p14ARF in primary breast cancer and analysis of inactivation mechanisms. J Pathol. 199, 289-297. Sreeramaneni, R., Chaudhry, A., McMahon, M., Sherr, C.J., and Inoue, K. (2005). Ras-Raf-Arf signaling critically depends on the Dmp1 transcription factor. Mol Cell Biol. 25, 220-232. Tannapfel, A., Busse, C., Geissler, F., Witzigmann, H., Hauss, J., and Wittekind, C. (2002a). INK4a-ARF alterations in liver cell adenoma. Gut. 51, 253-258. Tannapfel, A., Sommerer, F., Benicke, M., Weinans, L., Katalinic, A., Geissler, F., Uhlmann, D., Hauss, J., and Wittekind, C. (2002b). Genetic and epigenetic alterations of the INK4a-ARF pathway in cholangiocarcinoma. J Pathol. 197, 624-631. Tschan, M.P., Federzoni, E.A., Haimovici, A., Britschgi, C., Moser, B.A., Jin, J., Reddy, V.A., Sheeter, D.A., Fischer, K.M., and Sun, P. (2015). Human DMTF1beta antagonizes DMTF1alpha regulation of the p14(ARF) tumor suppressor and promotes cellular proliferation. Biochim Biophys Acta. 1849, 1198-1208. Vafa, O., Wade, M., Kern, S., Beeche, M., Pandita, T.K., Hampton, G.M., and Wahl, G.M. (2002). c-Myc can induce DNA damage, increase reactive oxygen species, and mitigate p53 function: A mechanism for oncogene-induced genetic instability. Mol Cell. 9, 1031-1044. Vonlanthen, S., Heighway, J., Tschan, M.P., Borner, M.M., Altermatt, H.J., Kappeler, A., Tobler, A., Fey, M.F., Thatcher, N., and Yarbrough, W.G. (1998). Expression of p16INK4a/p16α and p19ARF/p16β is frequently altered in non-small cell lung cancer and correlates with p53 overexpression. Oncogene. 17, 2779-2785. Wang, X., Zha, M., Zhao, X., Jiang, P., Du, W., Tam, A.Y., Mei, Y., and Wu, M. (2013). Siva1 inhibits p53 function by acting as an ARF E3 ubiquitin ligase. Nat Commun. 4, 1551. Weber, J.D., Taylor, L.J., Roussel, M.F., Sherr, C.J., and Bar-Sagi, D. (1999). Nucleolar Arf sequesters Mdm2 and activates p53. Nat Cell Biol. 1, 20-26. Weber, J.D., Jeffers, J.R., Rehg, J.E., Randle, D.H., Lozano, G., Roussel, M.F., Sherr, C.J., and Zambetti, G.P. (2000a). p53-independent functions of the p19(ARF) tumor suppressor. Genes Dev. 14, 2358-2365. Weber, J.D., Kuo, M.L., Bothner, B., DiGiammarino, E.L., Kriwacki, R.W., Roussel, M.F., and Sherr, C.J. (2000b). Cooperative signals governing ARF-Mdm2 interaction and nucleolar localization of the complex. Mol Cell Biol. 20, 2517-2528. Yoon, J.H., Choi, W.I., Jeon, B.N., Koh, D.I., Kim, M.K., Kim, M.H., Kim, J., Hur, S.S., Kim, K.S., and Hur, M.W. (2014). Human Kruppel-related 3 (HKR3) is a novel transcription activator of alternate reading frame (ARF) gene. J Biol Chem. 289, 4018-4031. Zheng, Y., Zhao, Y.D., Gibbons, M., Abramova, T., Chu, P.Y., Ash, J.D., Cunningham, J.M., and Skapek, S.X. (2010). Tgfbeta signaling directly induces Arf promoter remodeling by a mechanism involving Smads 2/3 and p38 MAPK. J Biol Chem. 285, 35654-35664. Zhu, J.Y., Woods, D., McMahon, M., and Bishop, J.M. (1998). Senescence of human fibroblasts induced by oncogenic Raf. Genes Dev. 12, 2997-3007. Zindy, F., Eischen, C.M., Randle, D.H., Kamijo, T., Cleveland, J.L., Sherr, C.J., and Roussel, M.F. (1998). Myc signaling via the ARF tumor suppressor regulates p53-dependent apoptosis and immortalization. Genes Dev. 12, 2424-2433. Zochbauer-Muller, S., Fong, K.M., Virmani, A.K., Geradts, J., Gazdar, A.F., and Minna, J.D. (2001). Aberrant promoter methylation of multiple genes in non-small cell lung cancers. Cancer Res. 61, 249-255.